Saudi Deputy Crown Prince Mohammed bin Salman waves as he meets with Philippine President Rodrigo Duterte in Riyadh (Handout/Reuters). King Salman's son Mohammed is now the desert kingdom's dominant figure—and the challenges before him are huge. This article was originally published here on Salon.com on Sunday June 25, 2017. Saudi Arabia’s line of succession changed last Wednesday morning. King Salman declared that his nephew, Crown Prince Mohammed bin Nayef, was out and that his son, Mohammed, who has served as deputy crown prince since April 2015, would now be next in line for the throne. 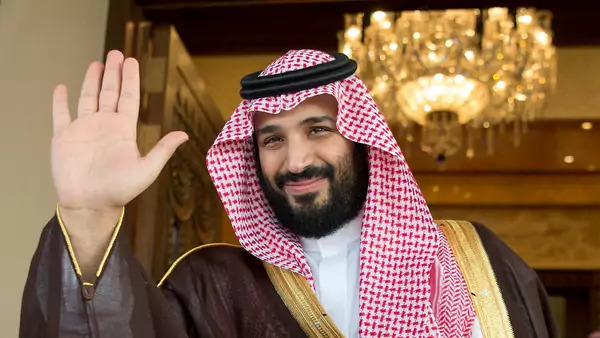 Over the last two-and-a-half years, Mohammed bin Salman has accumulated a vast portfolio that includes appointments as special adviser to the king, minister of defense, second deputy prime minister, and chairman of the Council of Economic and Development Affairs. Journalists, experts on Saudi politics and government officials have been expecting Mohammed bin Salman to displace his cousin sooner or later, though the move last week seemed sudden and without the broad consensus that is a hallmark of big decisions coming out of the royal court. Despite reports of rumblings and unhappiness among Mohammed bin Nayef’s supporters in the royal family, the struggle is now over. Now that his succession is sealed, there are two remaining questions for Mohammed bin Salman: Besides the throne, what does he want, and can he pull it off? The short answers are “unclear” and “maybe.” It is not that he lacks vision. In June 2016, the crown prince rolled out his signature policy, Vision 2030, for American policymakers in Washington. It is the most recent in a growing list of Saudi reform programs hatched in the offices of various international consultancies. Mohammed bin Salman’s plan revolves around diversifying the Saudi economy to decrease its dependence on oil and its related downstream industries, making the country a “trade hub” and “investment powerhouse” (whatever that means), developing a non-hajj-based tourism industry, Saudi-izing the workforce while giving foreigners easier access to the country, and loosening restrictions that the religious establishment has imposed on society. Vision 2030 also calls for the partial privatization of Saudi Aramco, the oil giant that anchors the country’s wealth and international influence. All of this sounds eminently reasonable, but beyond the details of the plan, the underlying logic of Vision 2030 is potentially destabilizing. What Mohammed bin Salman is attempting, taken as a whole, amounts to the radical transformation of long-established patterns that have guided the way business, politics and policy are done in Saudi Arabia. Any objective analysis of the Saudi economy would come to the conclusion that it is badly in need of reform. The dependence on hydrocarbons, entrenched interests of the royals, extensive patronage and an elaborate process of consensus building have had distorting effects. Yet as much as these factors pose challenges to Saudi Arabia’s growth and the development of a dynamic economy, they serve another important purpose: They are critical to maintaining a system that has ensured domestic peace and stability for a long time. The crown prince’s supporters argue that Vision 2030 is the only path forward and that it must not be allowed to fail. That is melodramatic posturing among those who stand to benefit from the reforms, but the Saudis who will gain from the reforms should not worry, at least in the short term. With Mohammed bin Salman’s promotion, it means that Vision 2030 will proceed — risks and all. The new crown prince has also been a central player in the recent effort to isolate Qatar. There are significant Emirati and Egyptian roles in this story but, politically and diplomatically, the blockade now in place could never have happened without the Saudis. No doubt there was a meeting of the minds on what to do about the Qataris among Mohammed bin Salman; his counterpart in Abu Dhabi, Mohammed bin Zayed; and the Egyptian leadership. But Riyadh now owns it. The Qataris are a problem given their support for Hamas in the Gaza Strip and the Muslim Brotherhood in Egypt as well as Al Jazeera’s persistent criticism of Qatar’s neighbors. They also have a more nuanced view of how to deal with Iran, which makes the Saudis particularly unhappy. All that said, it does not seem that Mohammed bin Salman (and his partners in Abu Dhabi and Cairo) thought through all of the implications of sanctioning the Qataris. Splitting the Gulf Cooperation Council harms the anti-Iran effort, the best evidence of which was Tehran’s delivery of 450 tons of food to the Qatari capital, Doha, six days after the Saudi-led blockade began. There are limits to the Qatar-Iran relationship, but to the extent that Arab countries on one side of the Gulf are in conflict with each other, it is good for the Iranians. The effort to bend the Qataris to Saudi and Emirati wishes has also prompted Turkey, which has commercial and security ties with Qatar, to establish an air bridge to Doha, bringing fresh produce, dairy and other necessities to Qatari supermarkets. There is no love lost for Turkish President Recep Tayyip Erdogan among Gulf leaders, but Turkey is part of that anti-Iran coalition that President Donald Trump thought he was building when he visited Riyadh in late May and addressed leaders and officials from more than 50 Arab and Muslim countries. The effort to isolate Qatar also puts the United States in the rather awkward position of having to act as referee among important allies. For all of Qatar’s questionable policies, it hosts U.S. Central Command’s forward operating base from which the United States is leading the fight against the self-declared Islamic State. It may be that the U.S. should look for alternatives, but moving bases or establishing new ones takes a long time. And Al Udeid Air Base, where U.S. Central Command is located, became more important to Pentagon planners after the Saudis demanded that American forces leave their country in 2003. It also did not seem to occur to Mohammed bin Salman that the Qataris would hang tough. After all, the vast amounts of money they have at their disposal — they are airlifting dairy cows from Australia to get around the sanctions — and friends like the Turks, along with sort-of friends like the Iranians, give Qatar some room to maneuver. Then there’s the U.S., which despite Trump’s tweets siding with the Saudis, does not want an intra-Gulf struggle to disrupt its strategic goals in the region: fighting the Islamic State and rolling back Iranian influence. Under these circumstances, the attempted isolation of Qatar seems as impetuous as Mohammed bin Salman’s critics suggest. Then there is the Saudi foray into Yemen that began in March 2015, a policy that is identified with Mohammed bin Salman and raises questions about his judgment. From the Saudi perspective, their intervention was a matter of vital national security because of the Iranian hand in the fall of the Yemeni government and the Houthi takeover of the capital, Sanaa, and a significant portion of the country. But the story is actually somewhat more complicated than that, involving Yemen’s former president, Ali Abdullah Saleh, whom the Saudis helped to push out; Saudi-Houthi hostility going back to the 1930s; and, yes, an Iranian effort to exploit instability in the region’s poorest country. It is a fight that has cost an estimated 10,000 Yemeni lives along with the Saudis killed in action, for which there is no reliable data. If not for the horror of Syria, there would be more attention on the humanitarian disaster in Yemen as famine and a massive cholera outbreak threaten to kill many more. The war has also cost the Saudis billions of dollars at a time when oil prices are low. Early on, the Saudis convinced themselves they were “fighting for the free world,” but the only thing they have achieved is what they most feared: an Iranian presence and proxy force in the Arabian Peninsula. Based on Mohammed bin Salman’s record, it is probably best for Saudis to hope that he can grow into his job. He has demonstrated some insight into what ails Saudi Arabia domestically, but his Vision 2030 requires diplomatic deftness rather than the raw power politics he has brought to bear thus far. One can appreciate his desire to break dishes, but it seems ruling Saudi Arabia requires them to be balanced. In some ways, Qatar and Yemen are laboratories for the new assertive, independent Saudi foreign and defense policies. But these have not gone well for anyone and promise to do more damage if left unchecked. There is a role here — if Trump does not undermine it — for Secretary of State Rex Tillerson, Secretary of Defense Jim Mattis, National Security Adviser H.R. McMaster or some combination of those three to help shape Mohammed bin Salman’s approach to the region. If they cannot, American policymakers will be confronted with a far bigger problem than an impulsive prince: the destabilization of Saudi Arabia.